A simultaneous French to English translation service will be available during the Forum. 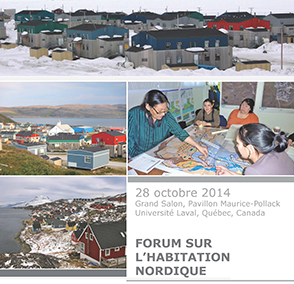 Housing in Nunavik: Policy challenges, northern housing design, community planning and development, and housing acquisition and ownership by Northerners. With northern housing needs significant and still growing, what are the advantages and limitations of current policies for provision of housing, and what approaches could better promote housing management, urban development, and control of real estate by residents? To what extent does current housing correspond to Inuit lifestyle, divided between modern technological needs and traditional activities? How can housing that is energy efficient, affordable, sustainable and integrated into the ecological and cultural context be constructed? What types of dwellings are needed and what processes of acquisition and management must be in place for occupants to assume ownership of and maintain these homes? How should communities be developed in the context of urban expansion that provokes intense real estate development with topography, terrain and climate posing serious physical constraints? How do land planners and builders deal with the challenges posed by the presence of permafrost and topography? How should space be better arranged and reorganized to improve living environments in communities that have grown with minimal planning? What are the effects of overcrowding on the health of inhabitants? What lessons can be learned from the experiences of other Arctic territories with an aboriginal cultural heritage and similar physical constraints, but different political regimes and historical contexts? © Copyright 2019 Northern Housing Forum. All rights reserved.